2018 Guide to Buying the Best Vacuum for Pet Hair. Buying tips and reviews. If you own dogs --short-coated, flat-coated, long-haired or someplace in between -- you know that at least once a week, you need to whip out the vacuum and rid the floor of pet hair. The usual rule of thumb for vacuuming is based on the number of dogs you have in the house. This will vary by family and if you have kids, you vacuum when you need to or when your kids refer to the fur ball under the bed by name. There are good vacuums and bad ones and some that do in a pinch, but rarely will you find one that can do it all from the floors to the couch, from the drapes to the counters and from those tough corners behind the computer to under the beds. Yes, pet hair has a way of infiltrating just about every nook and cranny in your home. Some homeowners jokingly refer to their couch and chairs as fur-niture, for obvious reasons. What to look for when it comes to the best vacuum for pet hair? We have some suggestions for you, some brand name vacuums that do a credible job and even a surprising tip based on actual experience. Perhaps you could just think of this as being a hair-raising review. We’re going to throw in the tip right away, just so you have an alternative to consider while you shop for the best vacuum for pet hair: a wet rubber glove. Yes, the kind you use to wash dishes. Not soaking wet, but damp. Make sure the fingers are ribbed. You’d be amazed at how well the fur comes up. This will take care of the furniture, but unfortunately doesn’t work for floors, so let's examine some vacuums that will. We’re only going to cover the best vacuums for pet hair from ConsumerReports.org and only refer to the ones that meet the needs of a family dealing with pet hair. In other words, models that ranked at least 70 points out of 100 for the criteria we have specified. Feel free to also do your own research, based on the specific needs of your family and what animals you have in the house. We are using the dog and cat criteria for discussing the best vacuum for pet hair. The reviews are listed in the order we have reviewed them. When it comes to UPRIGHT VACUUMS we found that three could do a great job of handling all the things a pet owner would want in a vacuum for pet hair. They are the Kenmore Elite 31150 Pet & Allergy Friendly Upright Vacuum, the Miele Dynamic U1 Dog & Cat Upright Vacuum, and the Dyson Ball Animal Upright Vacuum. At $229 from Amazon it is an excellent value as well, making it our top pick for the budget conscious pet parent. The Miele Dynamic U1 Cat & Dog Vacuum is rated #2 vacuum on the latest list and is also a recommended model. It gets excellent grades for carpet, has very good airflow and suction, is relatively quiet, has few emissions, handles very well and also rates excellent for pet hair. Approximate price is $550 from Amazon. Rated #3 on our list and 91/100 points for pet hair. 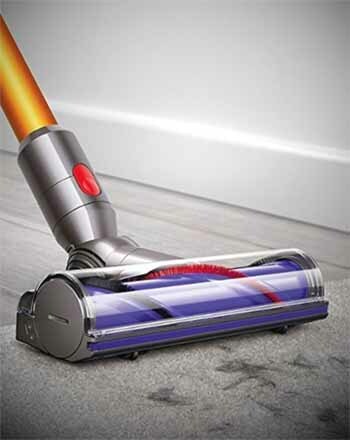 The Dyson Animal, does an outstanding job on carpets and is rated very good for bare floors, the airflow in the tools are wide open and free flowing, it isn’t terribly noisy like some on the market, has very few emissions, handles nicely and does an excellent job on pet hair. 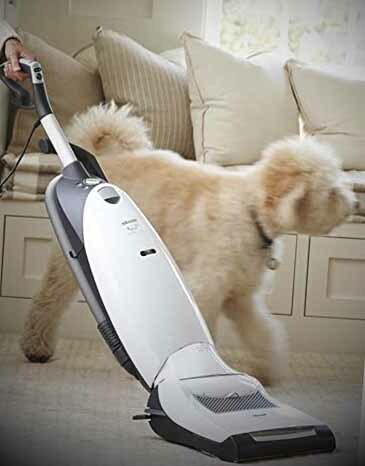 It is the fourth highest rated vacuum on the Consumer Reports list for pet hair and at approximately $400 from Amazon. It's sister vacuum, the Dyson Ball Multi Floor 2 is equally rated for pet hair. If you prefer a Canister, then consider the Miele Complete C3 Marin. 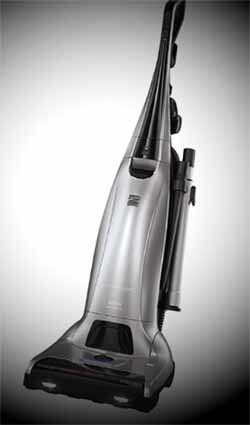 It has received high ratings for overall vacuum performance and 94/100 from Consumer Reports. Other top rated models for pet hair include the Kenmore Pop-N-Go 81614 (an Amazon Choice and 96/100 for pet hair), and the Kenmore Elite Pet Friendly CrossOver 21814, rated 98/100 for Pet Hair, an Amazon Choice and #2 Canister by Consumer Reports behind the Miele Complete, but at half the price!. The Miele Complete does a nice job on carpets, but an excellent job on bare floors has a micro filter, retractable cord and a great job on pet hair. Its airflow quality for the tools is excellent and all Miele vacuums get top marks for reliability. It has all of the features you would expect from a premium priced model including an upholstery tool among others. Approximate price: $1000 from Amazon. The Kenmore Pop-N-Go 81614 ranks Excellent in three areas of interest, bare floors, clean emissions and pet hair (96/100). If you are looking for a value priced cannister that is one of the best pet hair vacuums, this is a top pick. Approximate price: $255 from Amazon. 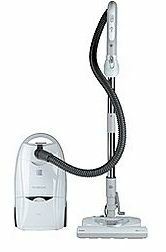 This Kenmore Elite Pet Friendly Ultra Plush 81714 is rated excellent for pet hair by Consumer Reports and a REcommended Canister Vacuum The The Kenmore Elite Pet Friendly UltraPlush 81714 gets a 95/100 for pet hair from Consumer Reports. It is also highly rated for Bare Floors. 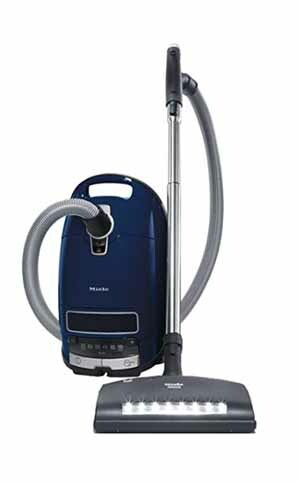 The Kenmore 22614 is also highly rated and is a bagless model for those that prefer this type of vacuum. Approximate price: $230 from Amazon for the Kenmore 22614 and $350 for the Kenmore Elite 81714 Pet Friendly Ultra Plush . 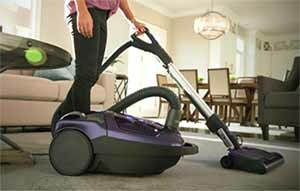 If you shop according to price for a canister vacuum, you might want to carefully compare the benefits and features, as the price ranges for the top three best canister vacuums for pet hair are pretty close together. TIP: these canisters are classified as bagged canisters and have a cloth or tough paper bag inside. Cloth bags are hard to clean if the pet hair has penetrated the cloth. Paper bags may be thrown away, making them more convenient. For SMALL VACUUMS, we found several models that get top marks for removing pet hair. This is a change from the recent pat where these vacuums didn't have the power to get the job done. < div> The Dyson V8 Absolute is a cordless vacuum that has a built in hand vacuum. While expensive at around $500, it gets top markets for pet hair, carpet and bare floors. If you have been frustrated with the performance of lower price models, this "Amazon Choice" and top rated performer on Consumer Reports one is worth a try. Approximate price $444 from Amazon. Editor Note: You can find similar perforamnce in the Dyson V8 Animal. Other small dog hair models to consider that were rated excellent for pet hair are the Bissell Air Ram 1984 ($200) and the Shark Rocket Complete with DuoClean HV380. Both are an "Amazon Choice" and get top marks for pet hair and are half the price of the Dyson mode.s They also get top marks for carpet and bare floor performance.